Staying at the BYD Lofts is making a statement.......! One of taste, individualism and a distinct preference for luxurious, modern, yet minimalist decor. BYD Lofts are NOT rooms. BYD Lofts are Serviced (Hotel) APARTMENTS, available for short or long term rental. Located on a private, quiet road with no through traffic, the BYD Lofts provide the ultimate in hip and chic accommodation. BYD Lofts comprises 19 spectacular one and two bedroom apartments ranging from 95-160m2 in size, and housed in a 5 storey, low-rise modern building with elevator. Each unit features fully fitted imported kitchens, very spacious living areas, and generous, oversized terraces. Each floor has just five 95 - 160sqm lofts, which have been exquisitely decorated using only the highest modern quality materials. From top to bottom, each individual Loft included, BYD Lofts is filled with objets d'art lending credence to the true, but often abused, meaning of 'Boutique'. 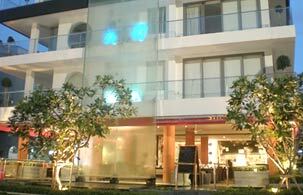 BYD Lofts are centrally located, close to the tourist hub of exciting Patong. Within a leisurely 100 meter stroll of the beach, delicatessens, ATMs, several banks, a plethora of restaurants & bars, you are never far away from the little conveniences that can make life so pleasurable. Everything you may need is at your doorstep and within easy walking distance. Recognized as one of the finest restaurants in Patong “JEAN-PIERRE BAR & RESTAURANT” provides highly innovative, delicious and aesthetically pleasing cuisine. . A superb breakfast is prepared here daily, as is lunch, dinner & room service. Free Wi-Fi hotspot. Weekly DJ parties, plus a host of other events; such as a daily 'cool hour' with free tapas, wine-maker's dinners with presentations and wine tastings. Christmas, New Year and other gala dinners also take place here. JEAN PIERRE'S RESTAURANT & BAR also regularly provides on-board catering services for yachts. The Amala Spa is a veritable haven of peace and tranquility, inspired and influenced by the traditions and rituals of Asian cultures and other modern fusion treatments designed to set you on a journey of ultimate spiritual, bodily healing and relaxation. The Rooftop Pool is both cozy and romantic, and affords sweeping views of the surrounding area and the mountains to the North and East.